User: United Stated Coast Guard, Aviation Training Center (ATC), Mobile, Alabama. ASI was selected by NAWCTSD to deliver the HC-144A Operational Flight Trainer Program. Awarded by the Naval Air Warfare Center Training Systems Division, the $25M program directly supports the U.S. Coast Guard’s aviation training requirements for that new aircraft platform. 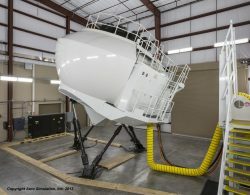 The program required the development and delivery of an HC-144A Operational Flight Trainer, supporting systems and related documentation to the U.S. Coast Guard’s Aviation Training Center in Mobile, Alabama – which ASI professionals fully support though the IMOMS Contract. ASI delivered a variety of trainer subsystems and supporting systems, including a 6-DOF Motion System, a first-of-its-kind World’s Largest 290°x60° Glass Visual Display System on Motion, Image Generator, Visual/Sensor Databases, Visual Database Generation System (VDBGS), Computer Aided Debrief Station (CADS) and Software Support Environment (SSE). ASI also developed and delivered a variety of training courses and Contractor Field Services. 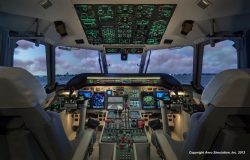 As part of the program, ASI lead a Live Flight Test using a Coast Guard provided aircraft to capture the data required to meet Federal Aviation Administration (FAA) Level D simulator requirements. 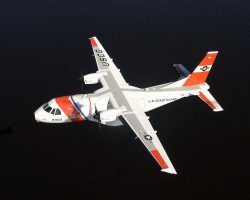 This data collection and model development/validation ensured that the delivered system fully met the Coast Guard’s defined HC-144A training requirements. After delivery of the device, ASI performed an upgrade of the HC-144A to match the HC-144B configuration. ASI also provides Program Management, Logistics Support, and Contractor Field Services to support the successful completion of this program.